In a mobile-first world, businesses are now facing up to a new reality that the overwhelming majority of their consumers are face down into their smartphones using messaging to communicate. But they have zero interest in downloading yet another mobile app that will sit on page two of their home page. Capital One is continuing on their quest to be where their customers are and embracing technological change. As virtual assistants and digital tools continue to become a larger part of today’s world, consumers’ expectations of what a bank can and should do are also continuing to evolve. People know longer think of a bank as an institution that “holds” their money until they need it. Ken Dodelin leads Capital One’s intelligent, AI-powered virtual assistant along with their chatbot products, digital messaging products (email, SMS and push notifications), and content management. In collaboration with a talented group of product, tech and design professionals, the team builds innovative products that drive simplicity and value to both customers and Capital One. Regular listeners of the show will remember that in 2016, Ken talked about being the first bank to offer an Amazon Alexa skill to provide customers with financial account access. Here in 2017, I invited Ken back onto the show to discuss the launch of the first natural language SMS chatbot from a U.S. bank. Neil: So a big warm welcome back to the show Ken, but for anybody that’s new, can you tell the listeners a little about who you are and what you do. Ken Dodelin: Sure. I’m Ken Dodelin and I am the VP of conversational AI products at Capital One and in that capacity, I had the great privilege of leading an integrated team of very talented product design technology and marketing folks through this journey of evolving the way we interact with customers from the traditional graphical user interfaces to a more AI driven conversational interface and it’s kind of fun and we’re having a blast. Neil: Well, the last time we spoke, I think Capital One were leading the way by enabling your customers to bank using that voice with Amazon Alexa. How was that received as that being regarded as a big success? Ken: So, let’s see. Yeah, we were the first bank to enable customers to access their financial accounts on the Alexa platform back in March of 2016 and we’ve continued to evolve that experience on that platform both by adding additional use cases. So in addition to your basic card and bank questions, we added the ability to ask questions about your auto loans and even pay your bill. We also added the ability to query a feature called, we call it, how much did I spend, which is about, hey, how much did I spend at Starbucks last month or how much did I spend at target last month? And just enabling folks through a conversational interface to get, those quick answers to questions that might be top of mind and help make them smarter about where they are with their finances. That skill has been pretty well received and we’ve even ported that experience, that voice experience over to the Cortana platform in the new invoke device that they had just launched and so now customers who want to access their Capital One accounts through Cortana and have an invoked built by Harman Kardon, they can do that as well. So we’re excited about continuing to go where the customers are and that, of course, sets us up to explore other interfaces from Microsoft across windows and their tablets, even Xbox, whatever you want to chase down the road, but we’re excited about bringing them on as a great partner. Neil: Fantastic. I mean, one of the things that I love about what you’re doing at Capital One is that you’re continuously pushing the envelope and fully embracing digital as a company. I mean, only the other day I was reading about Eno, which is the first natural language SMchatbotot from a US bank and I think it’s been in pilot for the last seven months and become available to millions of Capital One customers earlier this month but can you tell me more about Eno and also how that’s been received by your customers? Ken: Happy to. Yeah, so we were really excited a couple of weeks ago to take out of its invite-only pilot. 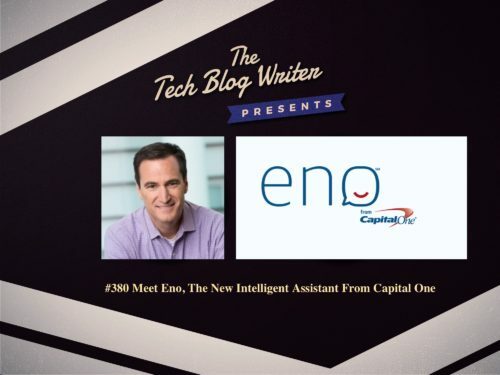 We had about a little more than 100,000 customers interacting with Eno over sms, using natural language chat and now like you say; it’s available to the millions of Capital One one card and bank customers. The reception to that product has been tremendous. We, it’s funny and you know the, when you launch an app, it comes with a certain level of infrastructure including an app store with app reviews and all that sort of stuff. There’s no analog for an sms AI, exists as a chatbot, so we kind of had to stand up our own. So we have a page on our website now. I’m happy to share the link with you and your listeners of what all the customers are saying about their initial interactions with Eno and it’s fascinating. People really enjoy the natural language interface. They like the speed with which they can get access to information and there’s also a love for the way you communicate over text, which by the way, it can include emojis,right? It was very important for us. We thought it would be a very Stodgy old bank thing to do to launch an interface in chat and then not understand emojis, which is by the way, like how half of all Instagram posts, including an emoji. So we saw that kind of data and say, all right, we better understand them and so you can actually pay your bill now through texts and instead of typing rigid, like confirm or nothing else to be able to confirm your payment, you can just send us a thumbs up emoji and what’s been fascinating for us is to see that more than, I think it’s around 60% of customers when they confirm their payment thorugh Eno, use the thumbs up emoji, which is a new way of customers interacting with their bank. It’s a little, it’s a small thing, but it’s an important thing about customer relationship and how we’re evolving with the way people speak rather than requiring them to speak like bankers. Neil: So what kind of information about their Capital One accounts can you just actually get from Eno? I think it’s amazing that you can actually get this information through emojis as well as text depending on your preference, but what kind of information can you get and I’ll just give you, could give me a few examples there and what emotions you would use. Ken: Sure. So it’s a dynamic product and that we’re, Eno is getting smarter from every conversation and it’s continually expanding its capabilities right now, you can ask for things like your balance, which is our most frequent request and by the way I’ll say a unique thing about the conversational interfaces, the number of different ways people ask for their balance has been a surprise for us. So, Eno has correctly mapped more than 2200 different ways that people had asked for the simple requests of how much money do I have or how much is the balance of my account because they use different adjectives they use, sometimes they just send us a dollar sign or a moneybag emoji. All these types of things and, we need to be able to understand them and so we, we use supervised machine learning to ensure that Eno continually just continues to get better and better at understanding customers. I’ll tell you, there’s a suite of capabilities from a, what’s my balance, recent transactions available, credits, the basics you would expect it. Then there’s also a capability for Eno to help you navigate our other digital products and so if you say something like, hey, Eno, how do I get a credit limit increase? If Eno doesn’t have the dialog management to manage that in the chat right now, Eno will just give you the link that says go to this exact page and you will be able to handle that and that’s a good meshing of the conversational interface with the gooey that has a nice result for customers. On the point of, hey, this grape variety of things we get from people, who have a variety of ways of communicating with us, we’ve been looking at the most frequently used intense, you know, every customer utterance we call it gets mapped to an intent by our natural language processing and so, as I mentioned, the most frequent thing is balanced people just checking their status. One of the things that has been fascinating for us is that the number three intent has been thank-you and when you think about that, there is no reason to thank a robot. It’s not like interacting with a person, but yet people are projecting their human interactions to this interface with Eno and there’s a whole body of research about the ramifications of that and how it’s evolving the customer and company relationship and even the human machine interaction and so we’re spending a lot of time thinking about what that means and how we can leverage it for a great result for our customers and our business. Neil: 2,200 ways to say, what is my balance that just blows my mind. So I’ve got to ask. I mean before that launch, tell me what else did you learn from that Eno pilot? I mean was it a real eye opener? Ken: We’ve certainly been learning a lot about the diversity in which people communicate with us. The other thing that we spent a lot of time on before launch that has been really well received by a number of folks has been the character and so our conversational AI design team in partnership with our brand marketing team did a great job of thinking through, what it means to create an AI and give it a name and any kind of visual representation. Some of the principles they were working backwards from where, hey, we don’t want to perpetuate the narrative that’s out there that are the stereotype that all digital assistants have to be female and so we sort of landed at a place where we wanted to have a gender neutral AI and we also had a number of personality principles like not being judgmental, being helpful, but also being human like in it’s communication and so all of this has resulted in a character, oh and then the visual representation, we steered away, we steer clear from giving it a full, like human like persona visually because the moment you do that, then you’re choosing an age or race and other things that might unlock people’s unconscious biases and so we were very intentional about. If you look at it as a visual representation, it’s a chat bubble with a smile on it, right? And so, you know, it was whatever people conjure up in their minds beyond that and the response has been very grateful from a lot of different folks that we haven’t leaned into that stereotype and that we’re representing Capital One’s inclusive culture in our consumer facing products. Neil: I’m so glad that you’ve just said that because I think we all pick up our phone now. We’re used to getting a film on Netflix or getting a cab on uber or just asking for our balance all for my smartphone but I think most people have a very little appreciation of all the hard work that goes on behind the scenes to deliver it seamlessly and even something simple like that about what the interface will look like and all the thought that goes into it. People just don’t even think about that. Do they? Ken: No and, and frankly they shouldn’t have to. Well, we keep, we keep top of mind is yes, there is a lot of hard work that goes in behind the scenes but ultimately, the consumer just cares about how we can help them better manage their money, take stress out of money management and achieve their financial goals and be more financially resilient and we feel like AI is putting us on a great path to do all of those things. The other piece about it that I think we’re getting into with AI is, more, you Know, we had this construct ford where we allow customers to personalize experiences which makes too human error filled the assumptions. The first being that we can decide, we can accurately choose what the options for the customers should be and then that the customer knows enough about themselves and their behavior and achieving the goal that they’ll choose the right option for whatever it is they’re trying to do and with machine learning, we’re going to get to a place in the not too distant future where, we just set up the goal for the customer and leaving them in control. Let the machine figure out how to optimize things and I think that’s going to be a powerful change in the way we interact, interact with our customers in a way that benefits them to a large degree. Neil: Where else do you see this heading and what are your thoughts on what the future has in store for conversational AI right across the board? Ken: I think there’s a, there’s a couple pieces here. One is taking the experience to customers where they are and so, again, for decades we’ve stood up websites and apps that live in a place that customers have to come to, to do things and very often, you know, when we send them messages, it’s, here’s some information now go deal with it at one of the places we’ve stood up. I think the conversational interface allows us to take both the information and bring it to the people in lots of different places and then allow them to take action or ask questions right in that channel. So even though an sms, for example, no longer do we just sort of say, hey, your balances due over sms, go deal with it in our on our website or app, but you can just respond and say, oh right, I want to pay my bill right now and you don’t wind up on a to do list that gets forgotten and so forth. So I think that’s a big part of it going where the customers are and then building out the capabilities to be helpful to have a more than just a presentation of navigable information, but to be able to present information in a smarter way that enables customers to retain control and also be better with their money. Neil: So us virtual assistants and digital tools continue to become a larger part of today’s world. Do you think the consumer’s expectations of what a bank can and should do is also continuing to evolve? And if so, I mean how hard is it to keep up to speed with these demands? reactively and proactively and so that’s the game we’re in. How fast can we go and meeting those evolving customer expectations. Neil: I think there are many other establishments, whether it be banking industry or I don’t know, retail even that still have one foot firmly in the past. I mean, do you think they’re going to struggle if they don’t just hurry up and embrace digital too? Ken: I think there’s certainly a lot of disruption going on across all industries driven by technology and in banking in particular, I think there’s an evolution happening here in the way that customers interact with their banks and even in sort of the human machine interaction that’s going to play out across the board and so the ability to converse with customers, may, you know, again, we come out with a lot of humility, maybe a differentiator, between banks in the future and we feel like it’ll be an important place for us to play, to be on the front of that if it, if it takes take shape. Neil: Now, I’ve been following you guys for some time now and we’ve talked about Amazon Alexa, now we’ve got Eno the chat bot, but that’s only half of what you guys do and you do now have a wide suite of digital tools, but are you finding that there’s any additional challenges and keeping all those platforms up to date across all the operating system? Ken: Absolutely. So as you mentioned, we have a large suite of digital tools are our mobile app. Just this year won a JD power award for being the best one in the industry, which we’re very proud of. Our conversational interfaces continue to get great feedback from customers and you’re right, how do you, as you go out to lots of destinations, how do you provide a consistent user experience that meets a certain quality bar and has the efficiency of a common backend to serve all of them and many kudos to our technology team here at Capital One because they have taken a platform approach to this and we certainly want to be able to move quickly and standing up and potentially even shutting down new channels as customers gravitate towards the ones that are most useful to them and so it will be a new challenge for us to be able to go where the people are because they go lots of different places and so we’re gearing up for exactly that challenge. Neil: So what’s next on the horizon for Capital One? Are there any other tech plans that you might be able to share or even just leave a few teasers with this today? Ken: You know, we continue to evaluate other places to put our AI. We have three things we look at as we’re evaluating new channels. One is the scale of the audience. Two is the maturity of the platform and how easy it is for us to move a great experience onto it and then three is something that’s very important to us as a bank. How has customer data being treated in that new environment and it isn’t meeting our standards for data privacy and security and so, we’ve found great partners already in Amazon and Microsoft who’ve checked all those boxes for us and we’ll continue to evaluate the landscape to try to find others who can allow us to bring this great conversational AI experience to our customers. Neil: Well a big thank you for coming on but before I do let you go, I mean, can you remind the listeners of your website url and also how they can contact member of your team if they have any questions just to keep people up to date with the developments at Capital One or even have to use Alexa or Eno with your account? Ken: Sure. So certainly we have our apps in the android and apple app stores. We also have Eno, you know, able to be enrolled for all of our customers capitalone.com/eno and so we’re having fun. We’re looking forward to learning from more conversations with, you know, and can’t wait to come back on the show sometime and tell you what’s new with us. Neil: Definitely. I’d love to get you back on because I think we’ve only just scratched the surface here as virtual assistants and digital tools continue to become a much, much larger part of the world today and like we, we touched upon earlier, consumers’ expectations of what a bank can and should do is also continuing to evolve. So I think this story’s going to go and go and go on. I really appreciate you taking the time to come on and talk about that today. So thank you. Ken: Thank you. Thanks for having me Neil.